And if you mess that one up, just turn over a new leaf and try once more. Not much to say about this; been in a weird space but didn’t want to write more depressing comics. It’s more fun to play with your toys, sometimes. Dragons need to go on interior journeys. Dragons need to lay their burdens down and only carry magic. Dragons need some empty space. Dragons need to relax. 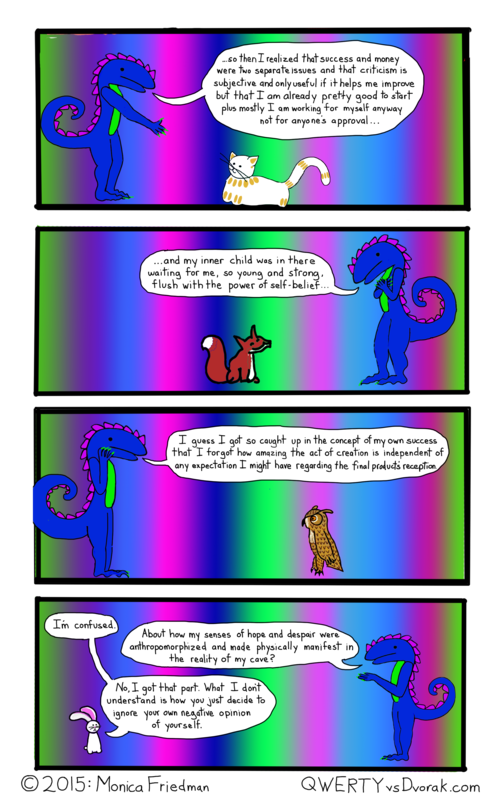 This entry was posted in 3D, dragon comics, webcomic and tagged 3d, comic, dragon, dragon comics, magic, pain, webcomic on July 29, 2016 by littledragonblue. It’s like deciding to ignore your lungs’s need for oxygen. You know how you sometimes have these eye-opening dreams where everything seems infused with wonder and meaning and there’s some kind of message or idea you want to carry back to the real world but once you wake up and try to explain it to other people, even if you can actually remember the dream in its entirety, you still can’t communicate the deep and sublime feelings that it instilled in you as you slept? It’s like that. My 2 guest essays ran on Panel.net in the last couple days: the first one is about world-building and the graphic novel Aya, and the second is about reading comic books to a blind person. It seems like people liked them and I will be writing more in the future. Pretty excited about that. I’ve also been trying to keep my book review blog updated. I probably only read about 2 adult books a month, but sometimes I read 10 or 20 kids’ books. This week I have a bulletin board to create, too. Everything depends on whether I have to serve jury duty, though. Ug. I really believe in democracy and the right to a trial by jury, I just don’t like being personally put out to ensure that it happens. I hate the courthouse and I hate being awakened too early and I hate being bossed around and I hate being forced to sit in merciless plastic chairs in huge rooms packed full of strangers. Jurors should be allowed to serve online. I would be much less uncomfortable if I could watch a trial on my laptop in bed. This entry was posted in Uncategorized and tagged book reviews, cat, comic, dragon, dream, fox, journey, kitty, magic, owl, rabbit on March 2, 2015 by littledragonblue. QWERTYvsDvorak: The Desert is Magic! 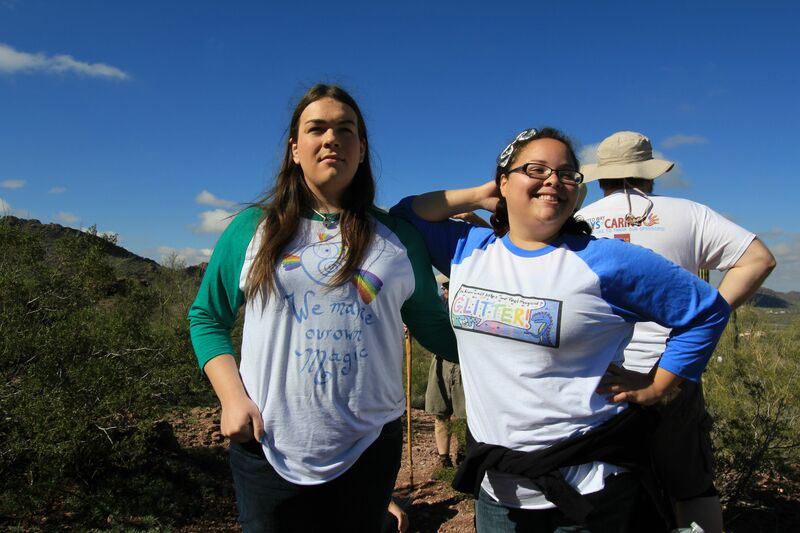 These lovely ladies are modeling their new, magically delicious QvD raglan shirts. On the left, Robyn is inspired in a green-sleeved “We Make Our Own Magic” rainbird shirt, while her charming wifey, Lisa boldly shows off a Dragon Comics “You Know What Helps Me Feel Magical? Glitter!” shirt in blue. The 3/4-length sleeve baseball-style shirts are made of a super-soft lightweight cotton that’s perfect for fun in the sun. It’s thinner than the standard style T-shirts and very comfortable. 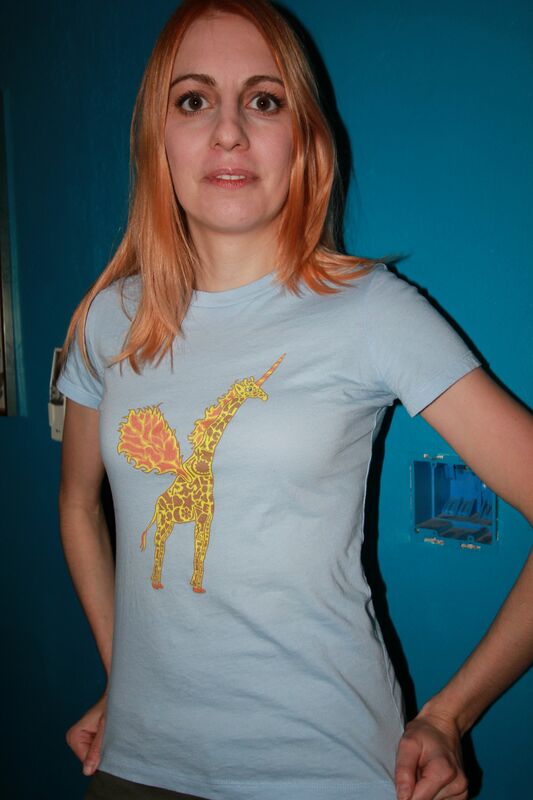 We’ve also got a bonus image of “Giralicorn,” now featuring an actual human head with attractive features. Daft Punk was not available for your party. Would you accept this charming substitute? She plays the ukelele like a champ. It’s been a strange day for art. I must have spent 90 minutes trying to write a comic script, which entailed writing a sentence, then crossing it out, over and over, until I had 2 pages of crossed-out dialog, which I then mined in desperation until I had 4 panels of material. Not sure I’m entirely satisfied with the punchline, but at least I can get 90% of the way through. I also spent an inordinate amount of time drawing a background I ultimately didn’t love, but had invested too much into to scrap it. You can be the judge, tomorrow. Strangely enough, I already have the punchline and visuals for Friday’s comic laid out, even though I don’t really know what the rest of the script will look like. All things being equal, it’s probably easiest to start with the punchline. I consider myself lucky if I have one. This entry was posted in Clothing and tagged 3/4 length sleeve, baseball shirt, bird, cat, clothing, comic, dragon, giralicorn, glitter, kitty, magic, punchline, raglan, redbubble, script, t-shirts, webcomic, writing on February 3, 2015 by littledragonblue. Wheeeeeeeeeeeeeeeeeeeeeeeeeeeeeeeeee! Possibly followed by some intense nausea. In reality, you won’t catch The Man outside without shoes, but let’s imagine that Dragon talked him into a good faith effort at practicing yoga. For the sake of the visual gag, of course. Somersaulting down a hill backward: now, that’s real. It’s a lot easier than it looks, and it’s good fun. You’ve just got to be careful about your cervical spine, which is not a problem for Dragon in any event, because Dragon’s skeleton is a lot tougher than a human’s, and more resilient, and some of Dragon’s external parts function as an exoskeleton. Dragon is very tough. Yes, I’ve thought this out. This comic really came down to the wire. What with the election and the crying afterward, there wasn’t much time in the day for drawing and writing. I’d love to get a bit of a backlog again. There was a nice one before I went to the Grand Canyon. Now it seems like every night I’m racing the clock. How do people even draw dailies? I suppose the people who do that probably draw better than I do. What about those artists drawing 2 to 4 dailies? Maybe they don’t have families. Anyway: Dragon can curl up into a perfect ball and then roll down a hill. That’s basically the essence of the joke here. 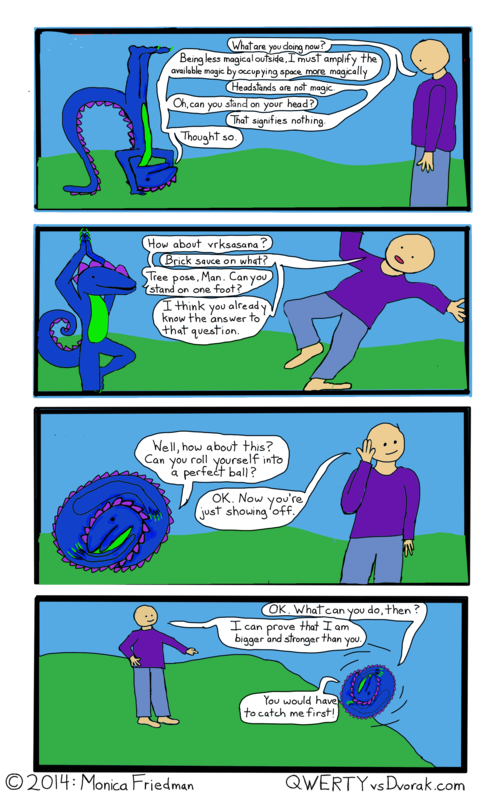 This entry was posted in Comics, Dragons and tagged comic, contortion, dragon, magic, outside, webcomic, yoga on November 5, 2014 by littledragonblue. You can never have enough magic, can you? Never enough hours in the day. The silly season has begun, the time of year when it’s not unusual to be invited to 6 different events in 4 days. Everything is mellow and pleasant in the autumn desert. Everyone is suddenly active and planning things and trying to squeeze the last drops of sunshine out of the year and if you blink you’ll miss it and there is never enough time. This isn’t a problem for Dragon, of course, because Dragon never goes outside and always has enough time to draw comics. Lucky Dragon. We could all use a little extra magic, that fine spun stuff found in the theater of the imagination. You just have to find a ticket, or be in the cast, or else sneak in through the side door when someone goes out for a smoke. 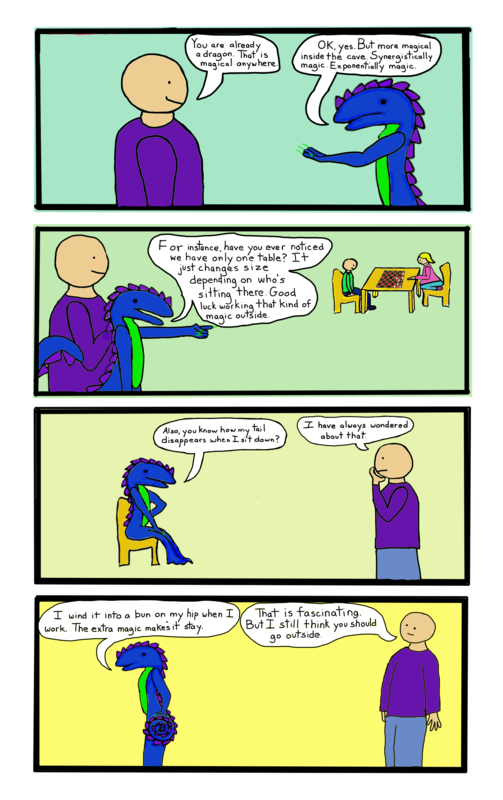 This entry was posted in Comics, Dragons, drawing and tagged cave, dragon comics, magic, outside, power, webcomic on October 22, 2014 by littledragonblue. 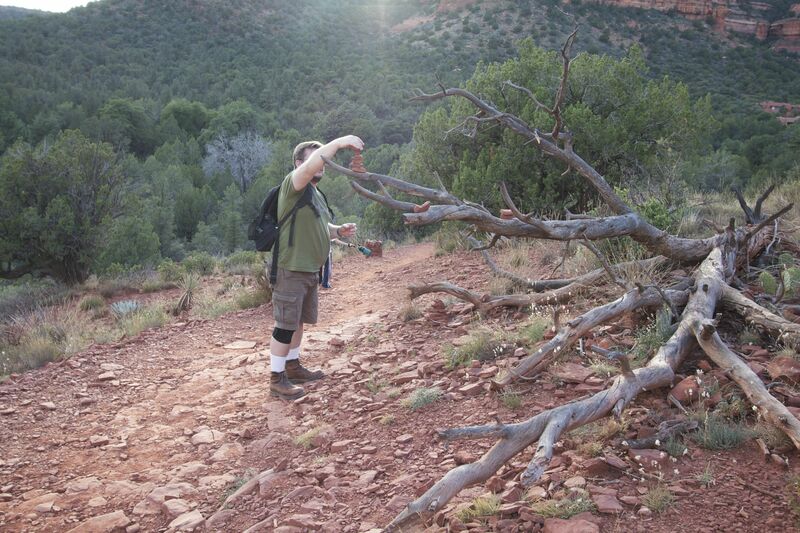 Boynton Canyon Vista is a short and sweet trail through the Red Rock Secret Mountain Wilderness around Sedona. From the sandy red earth a forest of pine and oak, yucca and prickly pear twists its way up a gradually sloping path toward a peaceful saddle known as one of the region’s seven spiritual vortices. The forest might make be magic, or people might make it magical. 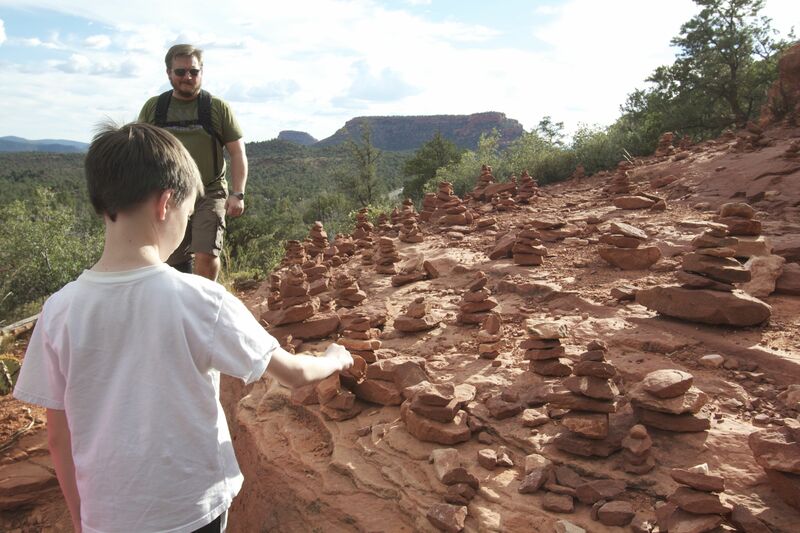 Wordless cairns mark the way. A seemingly natural proliferation of heart-shaped rocks encourages the custom of setting these cordate stones into the forked and spiraling branches of juniper trees, sharing “a gift of love from mother earth” (not my words) with visitors . Around the saddle, hundreds of rock balances ring the last levels of the gentle rise like a prosperous miniature city strung out along a series of plateaus. Jutting toward the sky on the south side of the side, a tower of red rock presides over the landscape. Heart-filled junipers shade the open land. The stones glow copper-gold against the surrounding forest. My little balance, which I built 3 times, because I knocked it over twice while doing something else. We climbed the spire of rock, although 3 out of 4 of us didn’t believe, at first, that we could do it at first. Climbing down was the hard part, which we completed without incident. Feeling empowered, we began our own rock balances on the wall to the north. 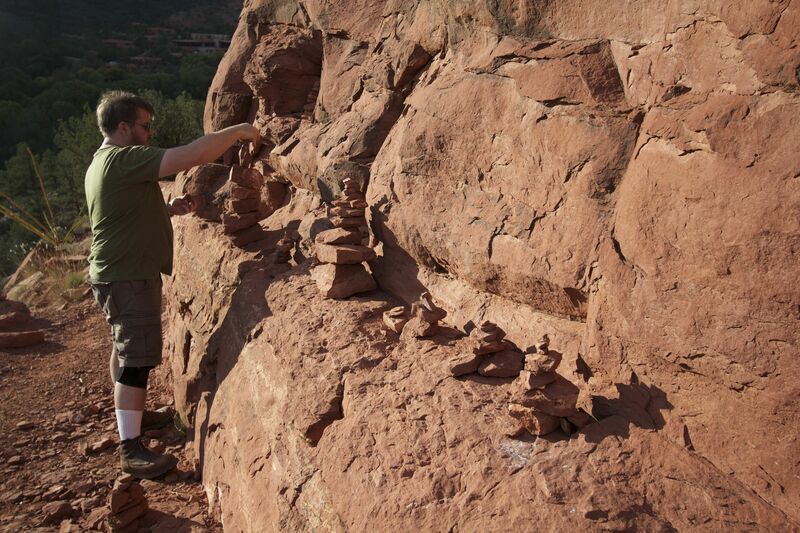 The Man combines 2 Boynton Canyon activities: rock balancing in a tree. The first time I visited this site was with the rabbit and the fox. The rabbit was in an anxious mood because of a sign mentioning bears in the area. A strange forest spirit in the guise of an old hippie offered us heart shaped rocks along with a lecture on the power of positive thinking and all encompassing love. The same man gave us rocks on this trip. “A gift of love from mother earth,” is his greeting. 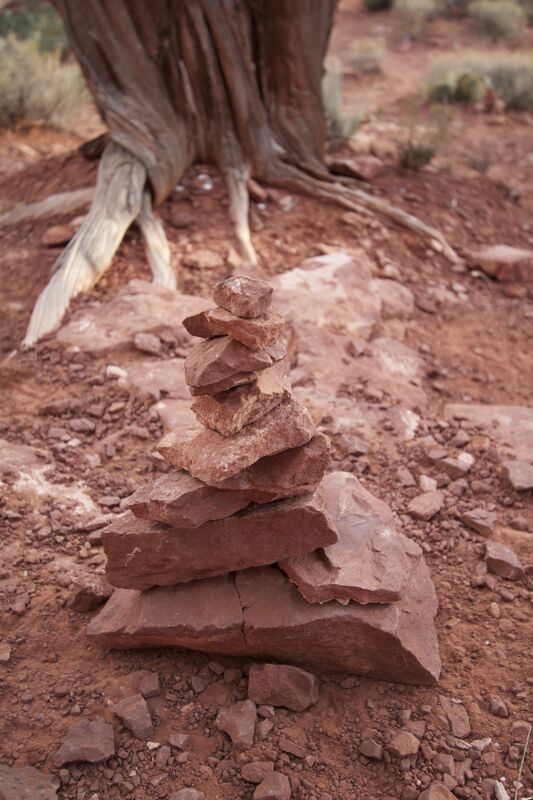 This entry was posted in creative exercises, nature and tagged 3d, boynton canyon, earthworks, magic, magical, rock, rock balancing, sedona, spiritual, travel, vortex on October 21, 2014 by littledragonblue.